WHERE YOU CAN PLAN ANY ADVENTURE TO ANYWHERE..
Book your trip online with our partners latest special travel deals found below..And save. DEALING WITH THE NATIVES.... If you are traveling to the US Virgin Islands consider this first. Having lived on the islands for two years (while a practicing lawyer), I offer one important tip-It is very wise to always approach any VI local with a friendly "Good Morning" or " Good Afternoon". I cannot over emphasize this simple courtesy. The locals expect this and may not even recognize you if you forget to do this simple introduction . The Virgin Islands locals are a generous and kind people, but remember that we are just visitors and guest to the local's islands... Also, just relax. The locals will take their time and you just have to go with the flow and relax also.. Remember that almost every day is beautiful.. No real need to hurry. If you are waiting to check your bags and your plane is ready to taxi, you will probably get a "no problem" response from the local check-in agent.. The natives will take their time, and really "don't worry".. Following this simple advice will help you have a pleasant trip to this tropical oasis..
Special deals on hotels,vacation rentals, flights, cruises and more to anywhere..
And book your trip online and save!! Enjoy God's beautiful creation at its very best! Start planning your Virgin Islands National Park vacation - and book your lodging - today on Expedia.com! US Virgin Island Travel Advice continued..
First- You will need no passport to enter the US Virgin Islands as a US citizen, as it is a US territory. However, once on the Islands, do take ample time to explore the many sights and attractions of the Islands, and do not just settle into a mega resort. If you are going to travel the long trip to the the USVI, you honestly need to spend some time going to some of the many beautiful beaches, finding quaint restaurants on the beach, exploring the interesting historic sites and spend a little time just enjoying the island experience. The tropical scents, the fresh ocean breezes and the sound of tree frogs singing at night can only be appreciated by being there to enjoy. Provided you are going to explore the many sights, you have several transportation choices. RENT A CAR OR JEEP-You can rent a car or jeep (a car is fine on most roads).. If I stay over a week, I will usually rent a car for at least a couple of days to explore the sights. A modest car will cost $60- $85 a day, with discounts on weekly rates . Consider renting a car from a local "mom and pop" rental company. Their cars are fine, they deliver, they are cheaper and they will negotiate. However, several of the national car rental chains do offer car/jeep rentals on all the major islands. HIRE A TAXI- You can hire a local taxi service, but it's not that cheap. A taxi can always be found at the airport, located on the far west end of St Thomas, and throughout the shopping districts on St John and St Thomas, and also at all the ferry docks on all the islands, or you can phone a taxi to pick you up anywhere. The taxis for the most part are small operators, but routinely reliable and trustworthy. It is hard to stay in business on a small island with a bad reputation. For two people to travel from one end of the island to the other it will cost around $15-one way per person.. With a tip expect to pay around $10 for even a short ride in town. And expect to ride with groups of other nice strangers on a large taxi van. TAKE THE "SAFARI" BUS AND SAVE-If you are traveling in close proximity to the major east/west highways on St Thomas, or St John, you can take the local shuttle bus, called the "Safari". The "Safari" is a reliable open air shuttle bus the locals use and it cost just one dollar to go from one side of St Thomas to the opposite side. (NOW THAT'S A TRAVEL DEAL).. A new bus arrives at numerous sites along the route about every ten minutes. The "Safari" bus is safe, interesting and amazingly fast.. (Unfortunately, the "Safari" is not suitable for transporting lots of airplane luggage, and the closest stop from the airport is about a mile from the St Thomas airport terminal)..
USE A FERRY SERVICE- If you travel between St Thomas and St John you will be traveling by ferry service..The ferry ride To Cruz Bay, St John (the St John ferry dock) is a short twenty minute ride by ferry departing from (Red Hook) on the far east end of ST Thomas, and the cost is about seven dollars per adult. (Keep in mind, the one hour taxi ride to the east end of St Thomas (Red Hook) from the airport is about $15 per person).. Or you can take the forty-five minute ferry service to St John from the shopping district dock in downtown Charlotte Amalie on St Thomas, and at a ferry ride cost of $13 and only an $8 -fifteen minute taxi ride cost from the St Thomas airport to the Charlotte Amalie ferry dock.. (See the St Thomas Source website below for the most recent ferry services schedules/prices and a sample of taxi rates).. The ST Thomas east end (Red Hook) ferry runs well into the night and much more often..(and prices do fluctuate), and the Red Hook ferry is always about half the price of the downtown Charlotte Amalie ferry.. A ride on either ferry is actually a nice way to relax after a long flight, with such beautiful tropical sights, sounds and smells along the way. And the ferries do run on schedule for the most part. If you are staying on St Thomas, you might consider renting a car on St John to explore St John. A couple of car ferries offer service out of Red Hook to Cruz Bay every 30 minutes, but round trip fare for you and your car is going to cost about $50. A party of six will fare well, and just about break even by avoiding the passenger fare. All the car rentals companies on ST John will gladly meet you at the Cruz Bay ferry dock with your car rental . I always use a "Mom and Pop" car rental company named (Conrad Sutton Rentals) on St John. Conrad and his family take great care of his cars/jeeps, and his lot sits right in the middle of Cruz Bay, and is also close to the ferry dock. And you can always park in Conrad's lot while in Cruz Bay, where in-town parking is often a problem. RENT A BOAT- And for the boaters, you can even rent a 25-26 foot motor boat for $500 plus a day from several operators, and be your own boat captain and go from beach to beach in your own boat... And as the islands are all in view and with a relatively calm surf, its hard to get lost at sea . And there are also lots of day charters offered for a sail boat/snorkeling adventure around the islands. SEAPLANE- This is how most will travel between St Thomas and St Croix.. Several ferry services have offered transportation service to ST Croix from St Thomas over the years, but they ultimately come and go.. Check when you are there. DAY TRIP TO BRITISH VIRGIN ISLANDS- Also, consider a day trip to the British Virgin Islands-(Tortola, Virgin Gorda, Jost Van Dyke or the other smaller BVI's). It is a great day trip by ferry..The amazing "Baths " on BVI's Virgin Gorda are worth the trip. The British isles are actually very close to ST John, and a day trip is easily workable. However, a US passport is necessary for this trip. Anyone considering a trip to the US Virgin Islands will need to decide which island or islands they plan to visit.. Having spent considerable time on all three of these tropical gems, I can say with experience that each island has its own unique personality. ST THOMAS-St Thomas is by far the most populated of the islands..The center of government and commerce, where most of the natives reside. St Thomas has the endless duty free shopping along its famous main street in Charlotte Amalie, with some of the best duty free retail shops in the world to buy jewels, electronics, liquor, designer clothes, etc.. And you pay no sales tax. Everyone should consider at least one day of shopping on main street Charlotte Amalie. 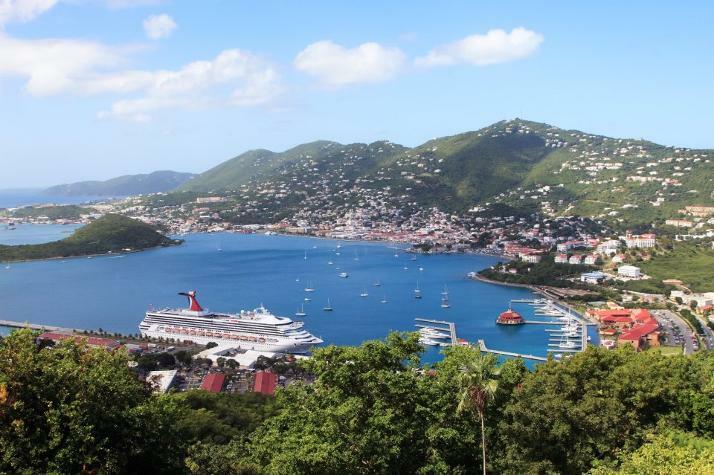 There is nothing like watching the main street barkers work the crowds and rubbing elbows with the cruise-shippers crowding the streets of Charlotte Amalie. ST JOHN- St John offers the best beaches/views, and the true tropical experience.. No other place in the world has such a magnificent national park covering two-thirds of an island, and not tainted by commercial exploitation. Cruz Bay is the only town on the small island and you can easily walk from one side to the other of Cruz Bay while stopping to shop at Mongoose Junction, right there on the ocean. While on St John, by all means rent a jeep and travel the north shore road to Coral Bay and have lunch at Ship Wreck Landing. The views are amazing.. Also, for any campers, The St John National Park has a couple of very nice camp grounds with everything you need for luxury camping. And several of the beach bars in Cruz Bay provide nice local bands throughout the week, if one is looking for nightlife activities. However, the Virgin Islands are for the most part not the place to go for nightlife.. After a hard day of sun and surf most retire early. ST CROIX - St Croix has everything the other two offer plus a couple of great golf courses... St Croix is more open and larger than both St John or St Thomas. And far less busy that St Thomas. Due to the distance, commutes to St Croix from the other islands is usually done by seaplane, and not by ferry. However, St Croix is still a lovely tropical paradise to visit. WATER ISLAND- Water Island is a lovely small island, that is mostly known by the locals.. I have vacationed there and it is a private oasis just a short boat ride from Charlotte Amalie, St Thomas,USVI. It has a couple of quaint tropical beaches and its almost like having a private island to yourself.. There are no five-star resorts on Water Island, but you will find private villas and a few guest houses that offer nice accommodations for your trip. Water Island is just a short ferry ride from St Thomas, but very private, as you can only get there on a small ferry.... Water Island would be a great escape for a traveling celebrity wanting to relax in privacy, but still close to everything the other islands have to offer. There are many various accommodations available on the USVI.. All three of the main islands have the five star mega resorts/hotels-that are pricey , but with all the amenities. Then there are also the small more relatively modest hotels with most amenities, but considerably less expensive. And there are guest houses with few amenities, but very nice and very reasonable in price. Many of the local workers in the USVI often rent a room in a guest house on a weekly or monthly basis, and many offer bed and breakfast. (See the Bed And Breakfast website above) Many visitors, especially those traveling as a large group, will rent a luxury villa or condo. It's very nice to rent a furnished condo or villa and be able explore the many sites in your rented jeep. And if you need the mega-resort experience, just have lunch at one, bring your beach bag and enjoy their pool and beach bar in a beach chair next to $600 a night tourist. Some of the large mega-resorts will actually welcome you as a valued patron. Again, its more laid back on the islands. And renting a lovely condo or villa will obviously save one a considerable amount over the cost of a luxury hotel resort, including the expensive travel cost of meals by cooking in your private kitchen in a very nice condo or villa. (See Trip Advisor below and VRBO above for a long list of vacation rentals in a wide range of prices).. And almost any hotel, condo or quest house on all the islands will have great ocean views from your private balcony.. And remember to travel like a local and just hop in your rented jeep and beach hop to a new beach every day.. You will never want to leave the islands..
All the islands have beautiful tropical beaches and I will only address just a few, and any of the many beaches in the USVI will be a very nice beach. St Thomas' most popular beach is probably Magens Bay. If you do not have a rental car the taxi fair to Magens Bay from most locations on St Thomas can be relatively costly. Magens Bay is a long lovely beach with a respectable beach bar/cafe. A lot of the locals find their way to Lindberg Beach, which is located a very short distance from the St Thomas airport. Lindberg has two nice beach bar/cafes adjacent to two modest hotels. The surf at Lindberg is calm and gentle. You can actually catch the "Safari" to Lindberg, and walk about a quarter of a mile to the beach from the drop off point.. If you enjoy snorkeling and spending a lot of time on the beach, I recommend St John.. Even the locals on St Thomas go to St John on the weekends. St John has many lovely tropical beaches, most within the Virgin Islands National Park. The most notable beach being Trunk Bay, with its famous snorkeling trail. And AS TO SNORKELING- (Actually, the best snorkeling on Trunk Bay is at the far western end of the Trunk Bay along the rocky cliffs next to shore, and not the marked trail around the small cay, which is crowded with all the tourist). If you go to Trunk Bay, go early morning before the cruise ships arrive and enjoy the beach by yourself. When the beach gets crowded with all the cruise patrons, the best advice is to just pack up and head back to town and set up at a locals favorite local beach, Hawks Nest.. Bring your own cooler to Hawks Nest, as there are no concessions, but it is beautiful, and close to Cruz Bay and much more private.. Outdoor toilets are available, but no running water. Just east of Hawks Nest is a small lovely beach, Oppienhimer Beach, (also called Gibney), where you will find some of the best snorkeling on the island in the shallow waters just off shore, and lots of coral.. If you want to explore the far east end of St John, then drive your rental car along the beautiful north shore drive to Salt Pond beach. Salt Pond is a lovely calm beach that is almost always dry (not much rain there) and never crowded. Salt Pond has parking, but requires a 200 yard hike to the beach. Also, drop us an email (counselor4452@hotmail.com), and we will pass on the name and location of a small cay where the snorkeling is unbelievable (lots of star fish and coral), and it also has a small sandy beach.. And decent swimmers can easily reach the cay from shore. You will probably be the only one on this small cay... And truthfully, any USVI beach is great place to spend the day and I have only named a few.. And if you have any other questions/suggestions, feel free to run those by us also. And also see our live webcams of New York City/Times Square and Orcas Island, Seattle in our following pages..
For tons of free travel advice/travel guides to anywhere just search Trip Advisor and Enzine articles below..